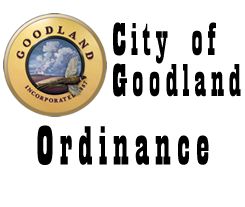 AN ORDINANCE CREATING A COMMUNITY IMPROVEMENT DISTRICT IN THE CITY OF GOODLAND, KANSAS; AUTHORIZING CERTAIN PROJECTS THEREIN; APPROVING THE ESTIMATED COSTS OF SUCH PROJECTS; CONTAINING THE LEGAL DESCRIPTION AND MAP OF THE BOUNDARIES OF THE DISTRICT; LEVYING A COMMUNITY IMPROVEMENT DISTRICT SALES TAX; AND APPROVING THE METHOD OF FINANCING THE PROJECTS. WHEREAS, the governing body hereby finds and determines it to be advisable to adopt this Ordinance to create the District, authorize the Project therein, approve the estimated costs of such Project, contain the legal description and map of the boundaries of the District, levy a community improvement district sales tax and approve the method of financing the Project, all in accordance with the provisions of the Act. SECTION 1. Creation of Community Improvement District; Legal Description and Map. A Tract of land in the Southwest Quarter (SW1/4) of Section Thirty (30), Township Eight (8) South, Range Thirty-nine (39) West of the Sixth P.M., Sherman County, Kansas. Commencing at the Southwest corner of said Section Thirty (30); THENCE on an assumed Bearing of North 02°38’29” East along the West line of the Southwest Quarter of Section Thirty (30), a distance of 814.46 feet, THENCE easterly along said extended south line South 88°02’06” East, 60.00 feet more or less to a point being the intersection of the east right-of-way of Kansas 27 Highway and the extended south line of the tract recorded in Book 133, Page 961 at the Sherman County Register of Deeds office, point being the True Point of Beginning. THENCE northly along said right-of-way line North 02°38’29” East 980.46 feet more or less, to the south right-of-way line of Interstate 70 Highway; THENCE northeasterly along said right-of-way line North 63°43’29” East 753.37 feet more or less to the extended east line of the easement recorded in Book 22, Page 262 at the Sherman County Register of Deeds; THENCE southerly along said easement South 02°37’38” West 1336.75 feet more or less to the northeast corner of a tract recorded in Book 77 Page 483 at the Sherman County Register of Deeds; THENCE westerly along the north line of said tract North 88°03’08” West 659.82 feet more or less to the east right-of-way line of Kansas Highway 27 and the Point of Beginning. Said Tract contains 17.54, Acres more or less. A map of the property contained in the District is set forth on Schedule I attached hereto and incorporated by reference herein. SECTION 2. Authorization of Community Improvement District Project; Estimated Costs. Acquisition, construction, furnishing and equipping of a new hotel facility to be operated as a Holiday Inn Express, or similar flag, and construction, renovation and furnishing of improvements to an existing hotel facility to be operated as a Comfort Inn, or similar flag. The estimated costs of the Project are $8,000,000. SECTION 3. Method of Financing. (a) The cost of the proposed Project is proposed to be financed by “Pay-as-you-go financing,” as defined in the Act, and paid from the fund of the City identified in K.S.A. 12-6a34. It is estimated that the City will pay $8,000,000 to the developer and owner of the Project, or its successor(s) from the proceeds of the Sales Tax, which amount shall be limited in amount by the Resolution authorizing the Project. (b) There will be no special assessments levied on property within the boundaries of the District. SECTION 4. Levy of Sales Tax. In order to provide funds to finance the costs of the Project, the levy, in accordance the provisions of the Act, of a community improvement district sales tax within the District, in an amount of 2% on the selling of tangible personal property at retail or rendering or furnishing services within the District (the “Sales Tax”), is authorized and directed. The collection of the Sales Tax shall commence on April 1, 2020 and shall expire the earlier of (a) 22 years from the date its collection begins or (b) until collections disbursed to the developer equal $8,000,000. The Sales Tax shall be administered, collected and subject to the provisions of K.S.A. 12-187 et seq. The City Clerk, upon adoption of this Ordinance, shall provide a certified copy of the same to the State Director of Taxation pursuant to K.S.A. 12-189. SECTION 5. The form of the Development Agreement dated as of November 6, 2018 between the City and Prairiesprings Hospitality, LLC, Prairiesky Capital, LLC and Prairiebreeze Capital, LLC (collectively, the “Company”) is approved. The Mayor or member of the City’s governing body authorized by law to exercise the powers and duties of the Mayor in the Mayor’s absence is further authorized and directed to execute and deliver the Development Agreement on behalf of the City in substantially the form presented for review prior to passage of this Ordinance, with such corrections or amendments as the Mayor or other person lawfully acting in the absence of the Mayor may approve, which approval shall be evidenced by his or her signature. The authorized signatory may sign and deliver all other documents, certificates or instruments as may be necessary or desirable to carry out the purposes and intent of this Ordinance and the Development Agreement. The City Clerk or the Deputy City Clerk of the City is hereby authorized and directed to attest the execution of the Bonds, the Development Agreement and such other documents, certificates and instruments as may be necessary or desirable to carry out the intent of this Ordinance under the City’s corporate seal. SECTION 6. Effective Date. This Ordinance shall take effect and be in full force from and after its adoption by the governing body of the City and publication in the official City newspaper. PASSED by the governing body of the City of Goodland, Kansas, on November 6, 2018, and SIGNED by the Mayor.